Deb's Cup of Tea: Assembly Required. The great "Hunt for a Dress" Day went from a depressing failure to a resounding success after Pam and I lunched. We went to Rock Bottom Brewery. Our server was attentive although she had to be flagged to refill Pam's drink and to bring us the check. The hostess wasn't at the door when we walked in and there was no sign saying you couldn't just go in and sit down. She was over talking with servers in a corner. She finished her conversation before coming to seat us, which I consider a service no-no. Pam had chicken mac and cheese with Parmesan bread crumb topping. I had a hickory BBQ burger made with turkey. The food was decent, maybe a bit overpriced. I'd go there again. Nothing to turn me completely away. We'd not had success in finding anything try-on worthy other than a few things at Von Maur. The best was an iridescent silk shantung jacket. This jacket was gorgeous. I could see a green or blue floral with an ivory background under this jacket. The dress I'm wearing was awful and I know you all love the socks. Carole gave me those for Christmas. But the jacket. Oh wow. And then we looked at the price. $210 and it wasn't on sale. "Let's go get lunch." Refreshed from lunch, we headed over to Jo-Ann Fabrics. Since we both sew, even if I did find something off the rack that needed alterations, we could fix that, but let's go see if there are any patterns worth noting. Trying on ready-made also helped me determine what size pattern I needed to look for. I used to sew, a lot. I made a lot of Carole's dresses when she was growing up. I made a lot of my clothes. Fabric stores were like bookstores. I couldn't go into them without coming out with a bag. I have patterns and material I have never used, two full boxes of material. Occasionally, I take it out and look at it and think I should just get rid of it, but I can't. "Some day," I think. If you sew, you probably know the feeling. Special occasion fabrics never seem to go away. There may be unique colors, depending upon the year, but you can always find sparkly, shimmery and fancy fabrics any time of year. We headed there first, instead of looking at patterns. Why look at patterns if the fabric choices are black, periwinkle and plum? They had a small section that was sari fabrics. Gorgeous, bright colors with intricately woven patterns. Aqua, purple, red, gold, royal blue and ivory, the colors were astounding. We round a gorgeous floral with a cream background, plus, there was adequate fabric on the bolt for either a dress or a jacket. Sold! Now to find a pattern. We searched through all the available books; Simplicity, McCalls, Vogue, Burda and New Look. I've never sewed a Burda, which is European, or a New Look. It turns out New Look is owned by Simplicity. I know Simplicity. The very first thing I ever sewed, a vest, was a Simplicity pattern. I scribbled down numbers and then looked through drawers. Some numbers weren't available. In the end, this is the pattern selected. I will not be making the ankle-length option. 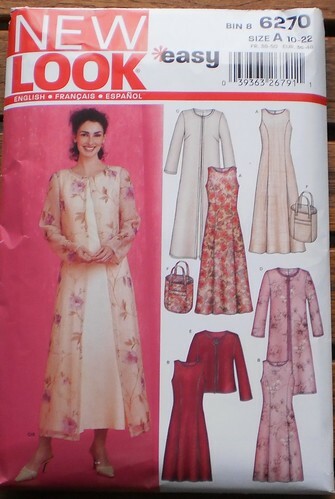 I will be making the short jacket and dress. Both are simple lines, exactly what I wanted. I'm not completely keen on the sleeveless part but I can live with this. Everything else is perfect including the price. The pattern was on sale for $3.99. 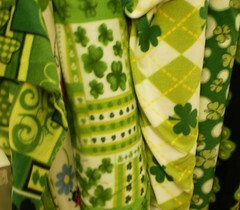 Pam vetoed this selection of fabric. But it's green, a wide variety of green, washable and easy care. She also said no to the bedspread look. This was very soft and in a huge width. 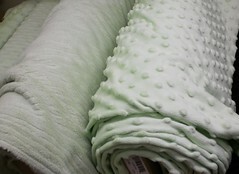 It has possibilities for a light-weight, fun jacket or a quilt. It took some time and dragging bolts of cloth to the front of the store to look at things in natural light. People looked at us kind of funny, as we draped, stood back, changed complimentary colors and stood back again. A gorgeous shantung, which was my first choice, turned out to be way too light-weight and would have required lining. Nope, not going to do that. I did that, once or twice, a long time ago. I don't have to do that here so I don't want to. 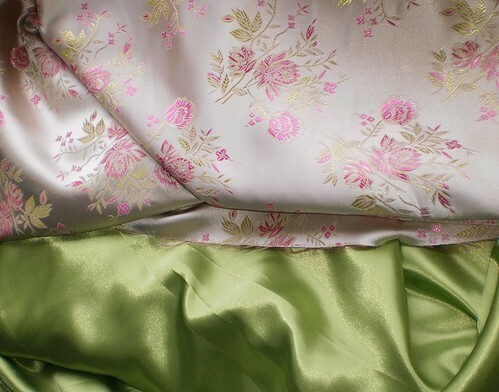 Eventually, I chose these two as my fabrics. The green is the dress and the floral is the jacket. The jacket closes with a frog but I'm not going to search for anything until I have the jacket made. I may opt not to close it. The brocade was on sale, 30% off, which made the total cost of that fabric, $20.67. The green was not on sale but Pam had a 50% off coupon, rescued from last week's Sunday paper. That made the green fabric $6.97. Without tax, I have a dress and jacket for $31.63. One of my decisions was to have shoes dyed in the appropriate color to match the dress. Nope. I'm going with a beige. Pam may have a cream-colored purse that she bought for her son's wedding and has used only for that. I would have to buy a new purse as I only own the brown one I take everywhere. I have to get thread and a zipper, but even with those, I'm coming in at a bit less than $210. So, what started as an "exploratory" event turned into a huge success. I'm so thrilled by this I can't tell you. Now to make room on the kitchen table for the sewing machine. P.S. According to Blogger, this is my 700th post. I like that it's a success story. How wonderful that you found material that so closely matched the invitation! I can't wait to see the photos of how this comes together.